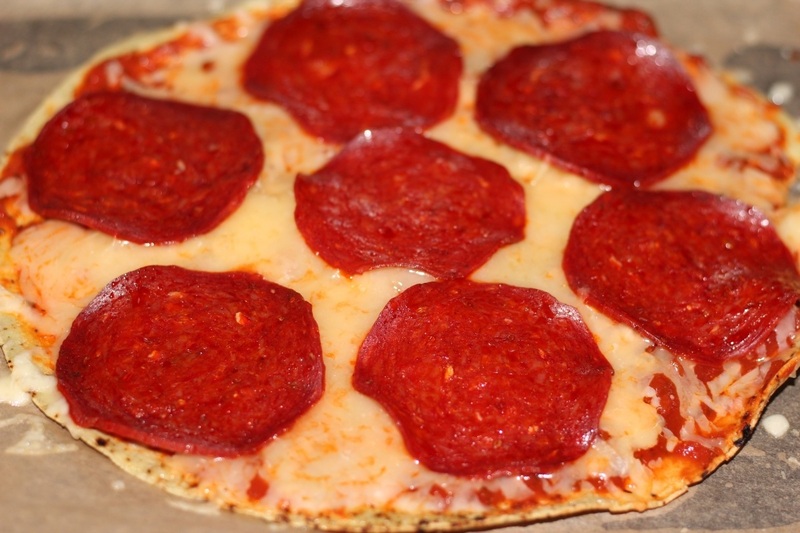 This gluten free pizza recipe is easier because it uses Trader Joe’s Rice Flour Tortillas for the crust. Before Trader Joe’s offered Rice Flour Tortillas I used to make it with their corn tortillas, but the rice is much closer to a real pizza crust flavor because it is neutral. I have not played with gluten free pizza dough yet but it’s on the to-do list! In this recipe you make a simple tomato paste sauce with a few other ingredients and then you cook some good Italian sausage to use along with a good dry salami that is not too greasy or salty. I found the Columbus brand at Trader Joe’s. It really is incredible and way too easy to eat! You could eat slices of this pizza as an appetizer since it is a smaller than normal, or you could use it as a main course with a nice salad. Add 1/4 cup of water and cook down some to marry the flavors until the sauce is spreadable and not too thin. Adjust with a little bit of sugar if too acidic. Set sauce aside until you assemble pizzas. Remove casing from 1 pound of mild (or hot!) good quality Italian sausage. Set sausage aside when it is done. use the last bits of chopped fresh basil on the very top and that’s it unless you think of something else to put on! Bake the pizzas on the 2 pans for about 6 minutes- just until the cheese melts and it all starts smelling yummy! This recipe makes 4 little pizzas. I cut them each into 4 pieces for serving. You could probably serve 1-2 slices per person as an appetizer or 2-3 slices per person as a main course with a nice salad. Welcome to Andreas Kitchen! If you are new here, you might want to subscribe to my blog to get updated whenever I post a recipe. Fact – No matter how careful you are, there are still some kitchen renovation companies in Calgary that may scam the life out of you. It is a common practice. However, such contractors are not inevitable. You will still hear and read about unsuspecting homeowners who don’t get their money’s worth when having their kitchen remodeled all thanks to opportunistic kitchen renovators. While there are still far more professional companies that get the work done, you still can’t be too cautious. No professional renovation company will ask you to shell out the full amount before they even start the remodeling of your kitchen. Therefore, if the contractor you are talking with demands this, it is time for you to say au revoir. Most experts will advise you not to pay more than a thousand dollars. Some would say don’t go beyond the 10% of the total service cost. The said amounts are enough for you to ensure the contractor that you are a sincere client and at the same time, it’s not too much money you’re losing in case the company does not deliver on what was promised. There are contractors who are very well versed at voicing out their goals for your kitchen renovation. They even have their own fantastic ideas to suggest. However, take everything they say with caution because as long as these designs aren’t specified on the contract, there’s a 50-50 chance you won’t see their fruition in your remodeling project. Hence, if you fell in love with the contractor’s ideas, insist on having them included in the contract before signing. This will give you the guarantee that the company is not just good with words, but actions as well. If you are hiring http://www.pinnaclerenovations.ca/kitchen-renovations, you should never be the one applying for the permit. Sometimes, small interior renovations can get away without a permit. However, it is in the law that whatever renovations you’re doing, you should have pertinent documents to carry out the work. If your contractor insists you should be the one doing the application, then you should never hire the person. It is always the company’s job to process the necessary papers. This will give you the idea whether it is actually a legit business or not. A few kitchen renovation companies in Calgary may not be totally honest when you ask them for the price of the remodeling. This is the reason why: It gives them an opportunity to rip you off with additional charges after the entire renovation has been made. Usually they would start the conversation with ‘we ran into problems while working in your kitchen.’ Sometimes, some of the problems they are saying is legit but the rest will be made up excuses just to raise the real price of ‘unforeseen issues.’ To avoid this red flag, you may want your kitchen to be assessed by an expert before pushing through renovations. This way you will have an idea what problems the contractor might face. Once the assessment is done, you can discuss the issues with the contractor. This will allow the company to adjust the real cost of the service before the starting the kitchen remodeling. If you notice the following red flags when meeting with some kitchen renovation Calgary companies, don’t hesitate to terminate the meeting with them and find a more reputable contractor that can answer your remodeling expectations.